A newly released CD recording of Ethel Smyth’s comic opera The Boatswain’s Mate, the first modern recording of the work, is conducted by University of Surrey alumna Odaline de la Martinez. 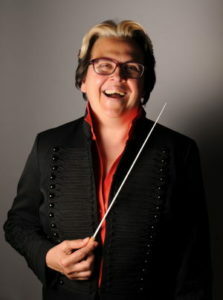 Cuban-American conductor Odaline de la Martinez (pictured) graduated with a MMus in composition in 1977, studying with Reginald Smith Brindle. In 1984, she became the first female conductor at The BBC Proms. A renowned interpreter of the music of Ethel Smyth, she returned to The Proms ten years later to conduct a special performance of Smyth’s opera The Wreckers. Appearing in the centenary year of the opera, which premiered on 28 January 1916 at the Shaftesbury Theatre, London, the 2-CD set features the Lontano Ensemble, which Odaline de la Martinez founded in 1976, and also includes historical recordings of Smyth conducting extracts from her operas in 1916 and 1930.